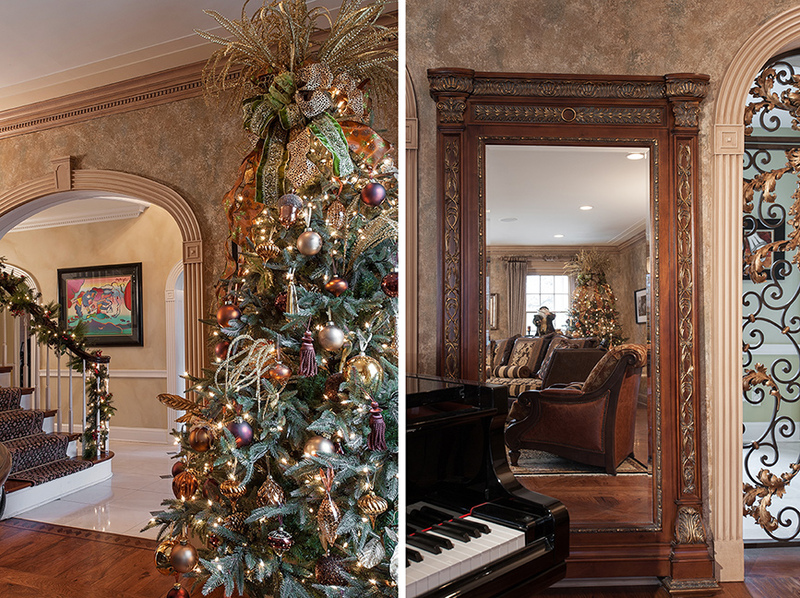 A wonderland at Christmastime, this fashionable Ladue residence reflects its owners' delight in the season. 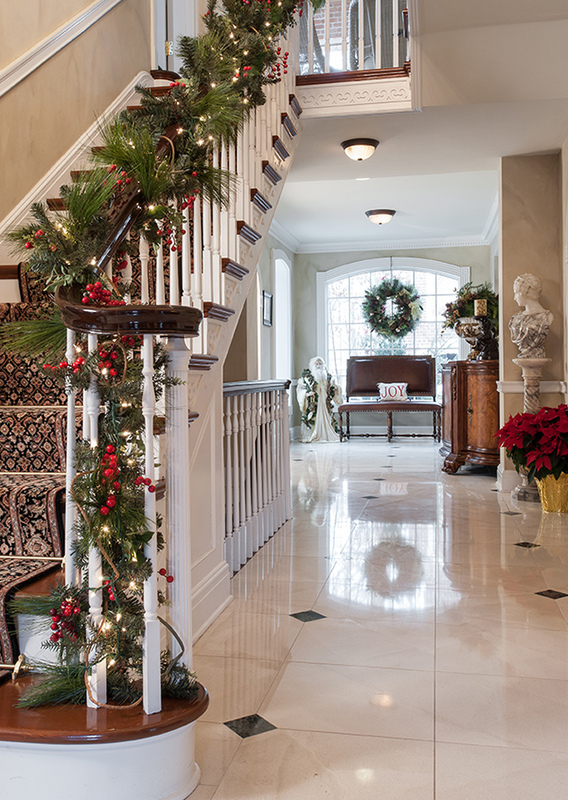 Gleaming travertine marble blankets the foyer and hallway floors, and a lighted garland wreathes the banister of the grand staircase. Displayed in the hearth room, the "main" tree is decorated in classic holiday colors and guarded by one of the couple's many Santas and life-sized coyote. Complementing the music room's gold-and-brown decor, the tree shimmers with an eye-catching variety of ornaments, tassels, leaves, fronts and lacy ribbon. Fresh poinsettias highlight the majestic fireplace in the gentlemen's room, and the deer head above the mantel sports a jaunty red scarf. 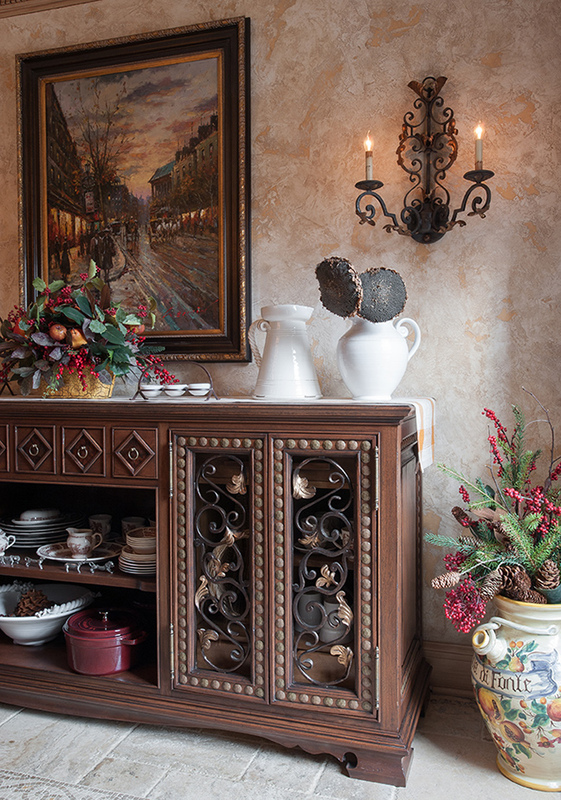 Holiday arrangements of green and berries accent the breakfast room's hand-crafted buffet and Italian urn. Characterized as a "masculine, woodsy" motif, the barroom showcases a burlap-trimmed tree and a Santa astride a bear flanking the rare 1860s-vintage chair. The patio planting area is filled with seasonal greenery, birch logs and oversize ornaments. Jim and Ashley Souers collect Santas. Not the traditional variety immortalized by Clement Clarke Moore. Instead, one-of-a-kind figures of all sizes, each hand-crafted and uniquely portrayed by artisans the couple has discovered during their extensive travels. 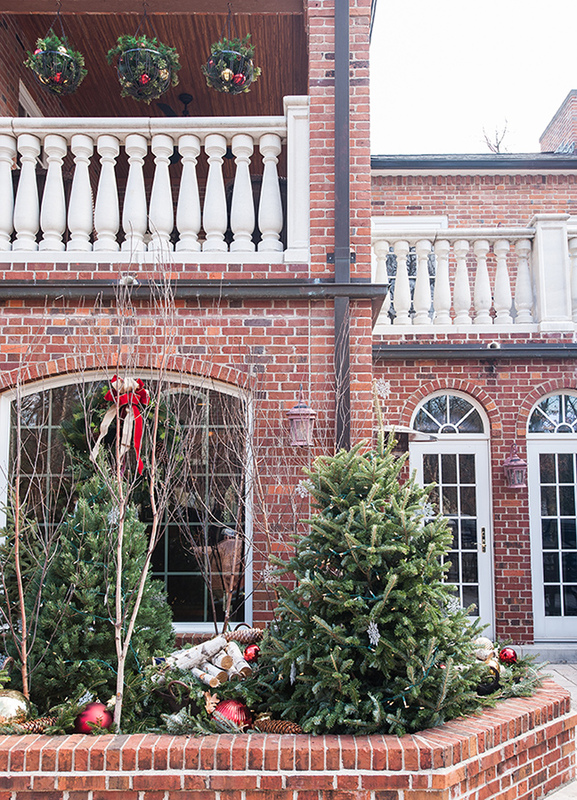 For this engaging duo, the winter holidays are a highpoint of the year, and decorating their magnificent residence in Ladue for the season is an art form that takes weeks of preparation. “We wanted the décor to be tastefully festive,” Ashley explains. “It’s designed to accent, rather than intrude on, the beauty of the house.” That same attention to detail is evident throughout the 12,000-square-foot home, which is perfectly adapted to the couple’s sophisticated-yet-relaxed lifestyle, busy professional lives and jam-packed social calendar. Jim purchased the stately, 1940s-vintage Georgian in 1997, adding stone to the exterior and wing walls for a more Italianate look. The interior renovation and design was undertaken in 2010 and overseen by Jane Ganz, ASID of Directions in Design. Except for the travertine flooring in the foyer and hallways, all of the main-level floors were redone. The elaborate trim work was meticulously refinished, and the all-white walls became a blank canvas for a fabulous array of trompe l’oeils by Claude Breckwoldt and faux finishes by Koch Bros. Decorating. 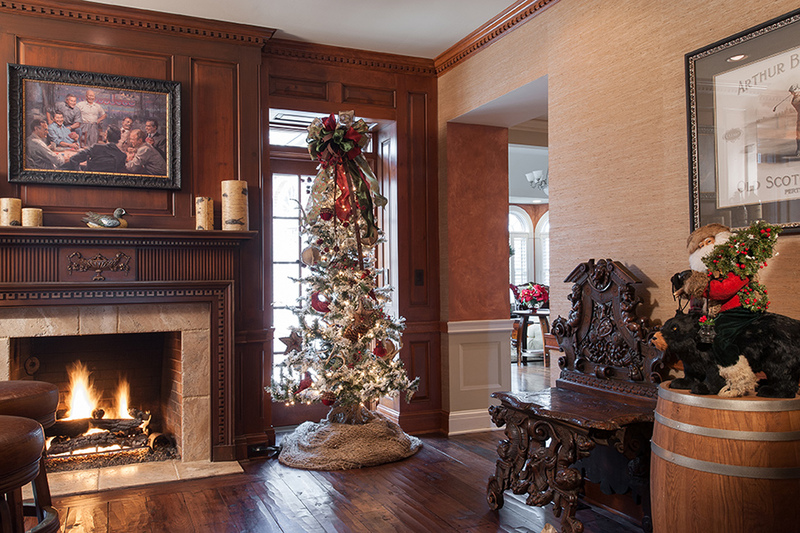 Decked out for the holidays, each space emanates the spirit of the season without detracting from the elegant architectural features and furnishings. Three towering Christmas trees are situated in the home’s primary entertainment spaces, each decorated to emphasize the room’s appointments. Ashley’s creative flair is evident in the selection of ornaments, most of which she personally chose from Three French Hens. Describing the music-room tree, Ashley says, “I was going for ‘jazzy’ here.” Draping the base is a pastel-blue velvet tree skirt, trimmed with artificial gems. 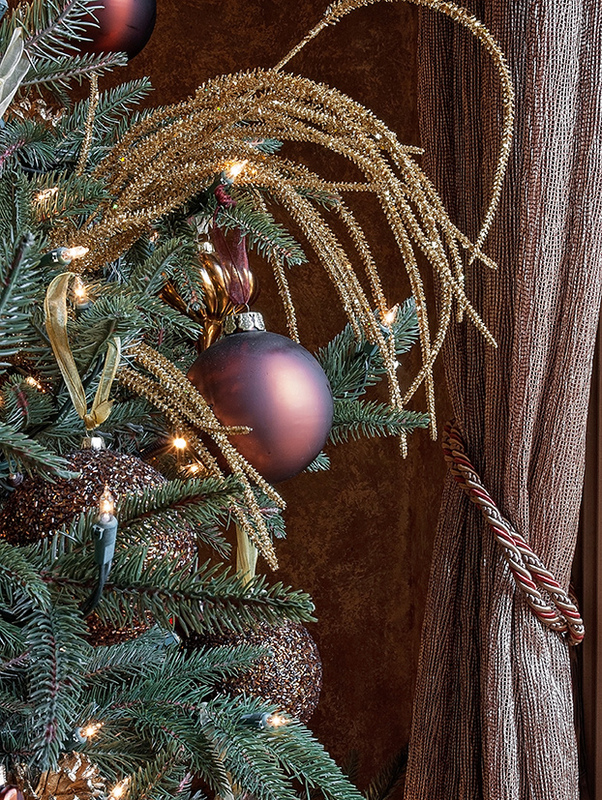 The ornaments simulate the browns and golds of the room’s color scheme, and the tree topper is a stylish spray of gold fronds. Designed by Ganz, the gentlemen’s room is unequivocally masculine, with Brazilian acacia floors, tobacco-toned leather chairs and a genuine bearskin rug. Architectural windows light the turret-style space, and the dramatic dome was embellished by Breckwoldt, who also added metallic accents to the imposing fireplace mantel. 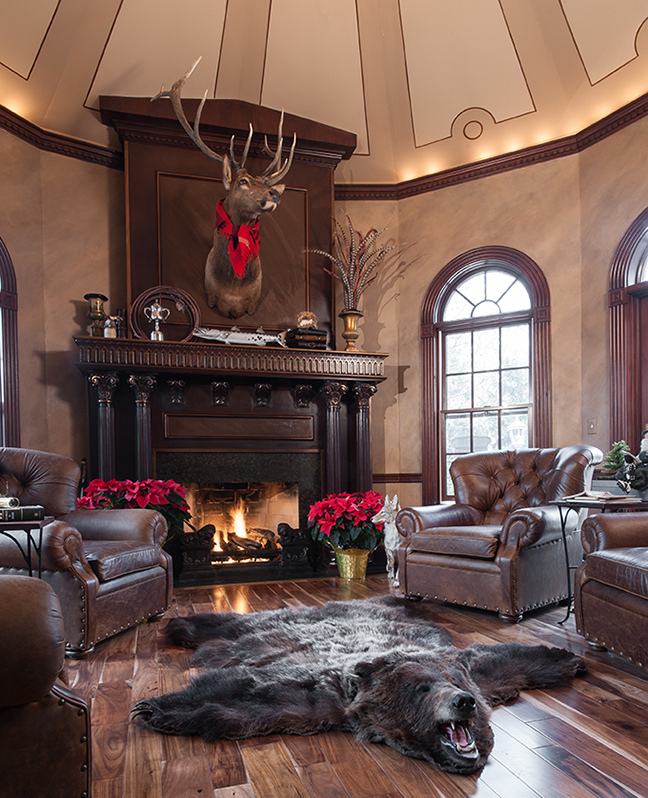 Illustrating the owners’ delightful sense of humor, the deer head above the fireplace sports a bright red scarf, and this room’s distinctive Santa, made by their favorite artisan in Colorado, is cloaked in animal hides. For the barroom’s flocked Christmas tree, Ashley chose a “masculine, woodsy” motif – a loose-woven burlap skirt and an assortment of ornaments that includes cardinals, pinecones, antlers, burlap-covered balls and a large multi-colored bow at the top. Another of the owners’ subtle touches of whimsy, perched on a wine barrel against one wall is a small, mistletoe-bedecked Santa riding a bear. The “main” tree is located in the hearth room, which is dominated by a spectacular fieldstone fireplace that extends to the soffit of the octagonal ceiling vault. The flooring in this space is particularly interesting and was hand-burned, scraped and beaten to give it a more historic appearance. 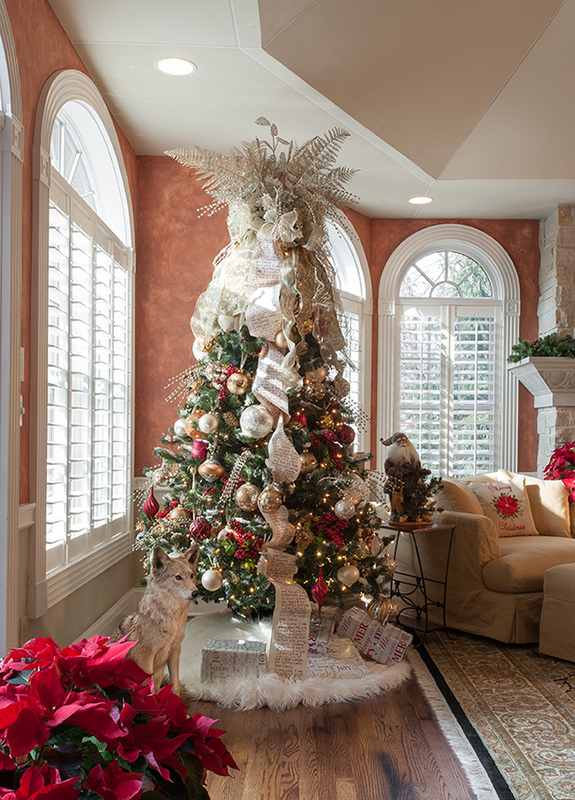 Here, Ashley went for “elegance,” designing the tree with a classic silver/white/gold/red palette. Holly berries and pearl sprays are tucked among the branches; a faux-fur tree skirt surrounds the base; and silver ferns serve as the topper. Standing guard over the arrangement are a pixyish Santa and, yes, a life-sized coyote! The breakfast room is another example of the Souers’ desire for personalized living. Flooded with natural light, it’s a full-sized dining room, which they preferred to give a luxurious “morning feel.” The Global Granite floor is a masterpiece of limestone, granite and marble, with an inset mosaic border. The walls are delicately faux-finished and accented with wrought-iron sconces, and the buffet – hand-crafted by V3 Studios – is a tour de force in antique hickory, wrought iron and gold leaf. Readily visible from the home’s many rear windows, the outdoor living space is fully decorated for the season, as well. Defined by a huge brick-and-fieldstone fireplace, the expansive patio is stone tiled and elevated above the pool area. An herb garden in warm weather, the patio’s brick-walled planting area is filled with a bed of pine boughs, birch logs and oversized ornaments and pinecones – a theme repeated by Rand Rosenthal Landscaping and Design in the urns, baskets suspended above the second-floor balcony rail, and around the fireplace. With so much to see and enjoy, an invitation to join the holiday festivities chez Souers must be irresistible. And before the season is out, it’s likely another Santa will be added to their collection, too.